How to make cluster bean dry sabzi? To know more about cluster bean/guwar refer here. Cluster beans are rich in fiber. They act as good laxative. They control the blood pressure, and good for diabetic patients too. There are numerous health benefits of cluster beans. You could read more about them here. My mom makes gorikai masale palya which we all like. Other than that, I make this gorikai bhath. During a casual talk with my neighbor I asked her what else I could make with the cluster beans. She gave me this recipe & I prepared it the same evening. I liked the simplicity of this dish & it hardly takes any time to get it done. She is from Raichur, and this is how she and her mom makes the gorikai palya. 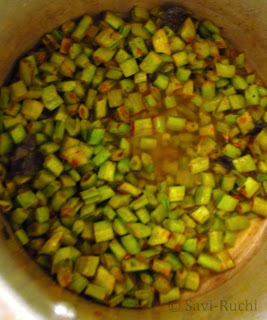 Trim the edges of the cluster bean & chop them fine. Add oil to a pressure cooker. 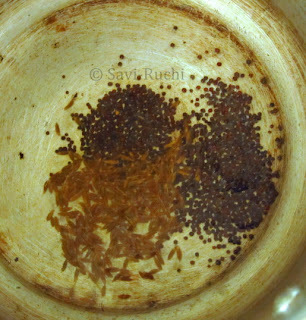 When oil is hot, throw in the mustard seeds & cumin seeds. When the seeds crackle, add in the curry leaves. When leaves wilt, throw in the chopped cluster beans, salt, red chilli powder, coriander powder, garam masala, turmeric powder & mix. Add about 1/4 cup of water to the cluster bean mixture & pressure cook in medium-high heat for it for 1 whistle. We do not want any water to be left after the vegetable is cooked. Hence add little water! Allow the pressure to be released. Add in the roasted peanut powder & mix. 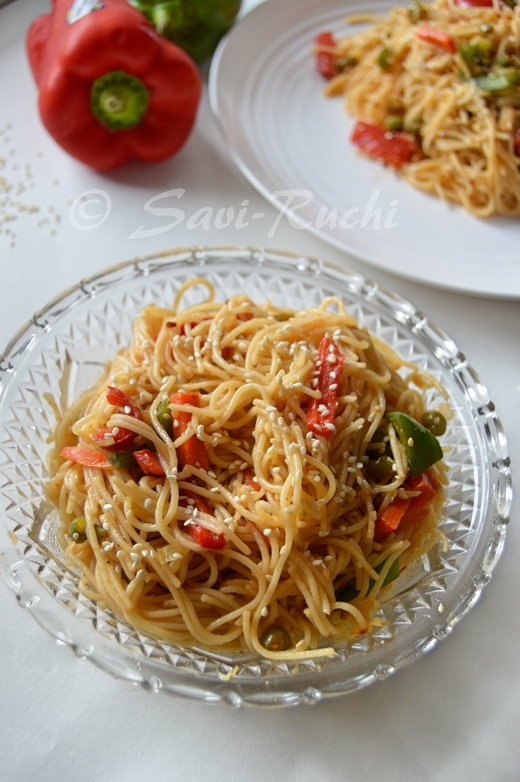 Serve it hot/warm with rice or roti. Instead of using the pressure cooker, you could even cook it using the stove top method. The cooking time will increase if you are not using a pressure cooker. And you might need more water too! 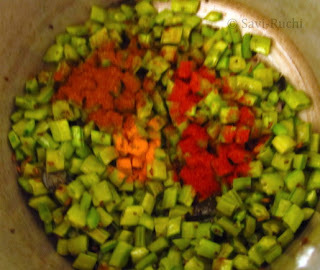 As it's a dry sabzi, do not add too much water while cooking. We need very little water. This is a basic North Karnataka Style palya recipe. You could make similar palya with other vegetables like ivy gourd / thondekai / tendli or french beans too. You could adjust the peanut powder according to your preference. Delicious and healthy looking subzi. Wonderful preparation. this is how we too make gawarfali ki sabzi :) I love this sabzi a lot looks so delicious dear :) very very inviting clicks there!! Thank you . Simple explanation and it works .